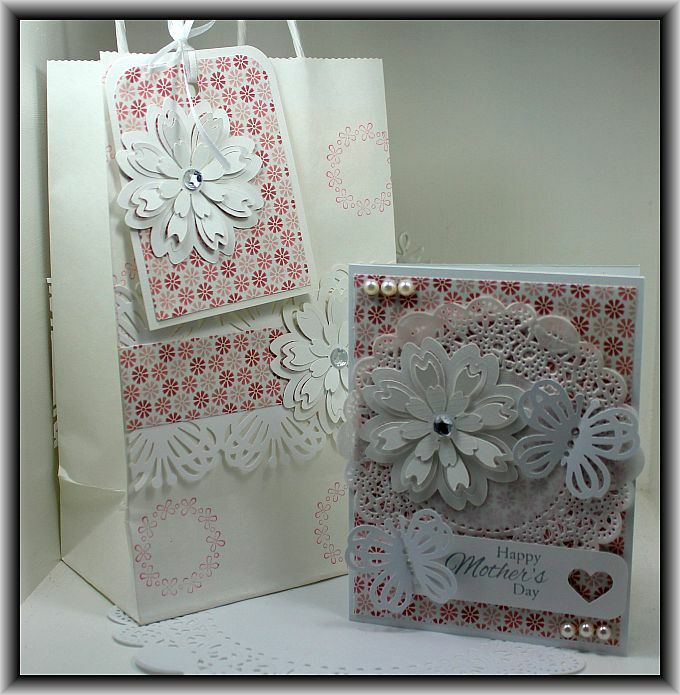 I thought I would pop in and post a quick little card I made using the Flourishes Year In Flowers stamp set. I love the colors on this card, I don’t use yellow often but found these blank cards on discount at Michaels and picked up a few packages. Now that I made this, I wish I had bought more! I used my Inktense pencils to color the flowers and added a bit of stickles to give it some shimmer. I am off to bed soon as I am up at 5 am to get ready for work. I hope you all are having a great week! 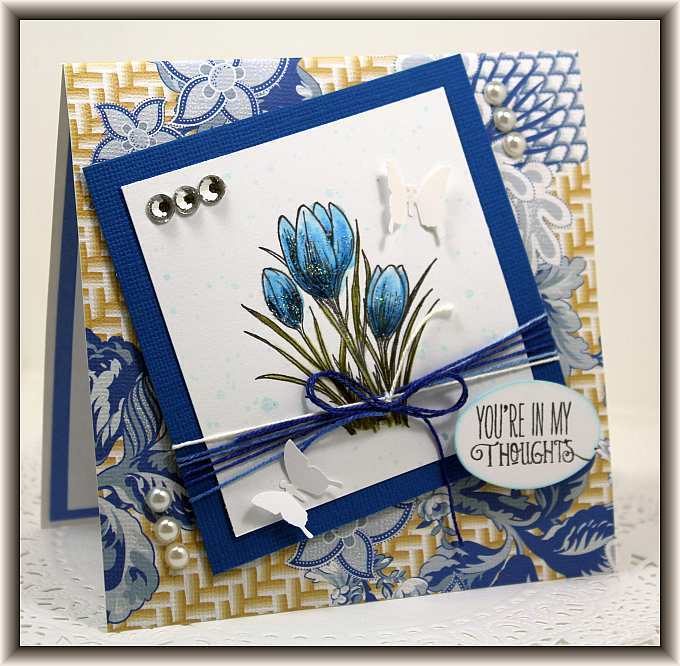 I have been busy at work and haven’t been in my craft room all week but I thought I would share a card that I made last weekend with you. I love all the colors in this background paper that I made using my distress inks. It is such a cheerful looking card. 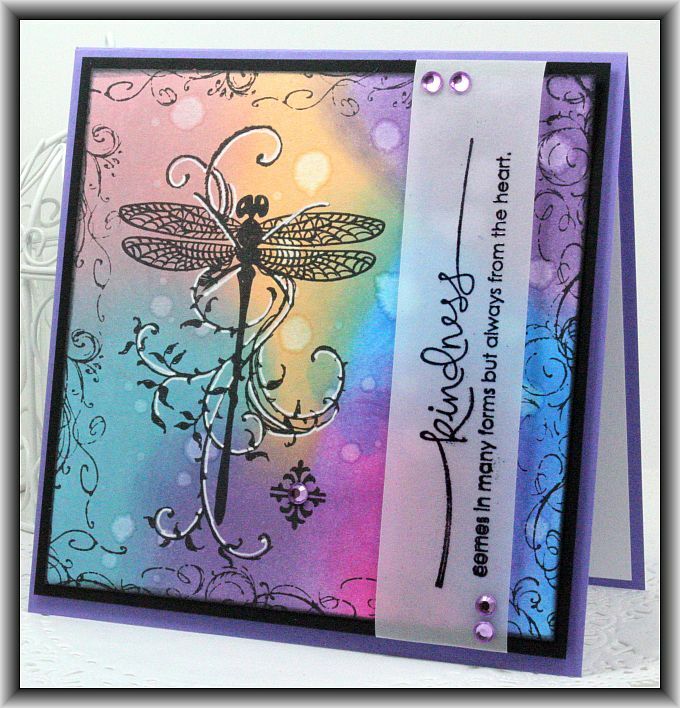 I of course reached for one of my favorite stamps, Dragonfly Vine. I have used this stamp SO many times! 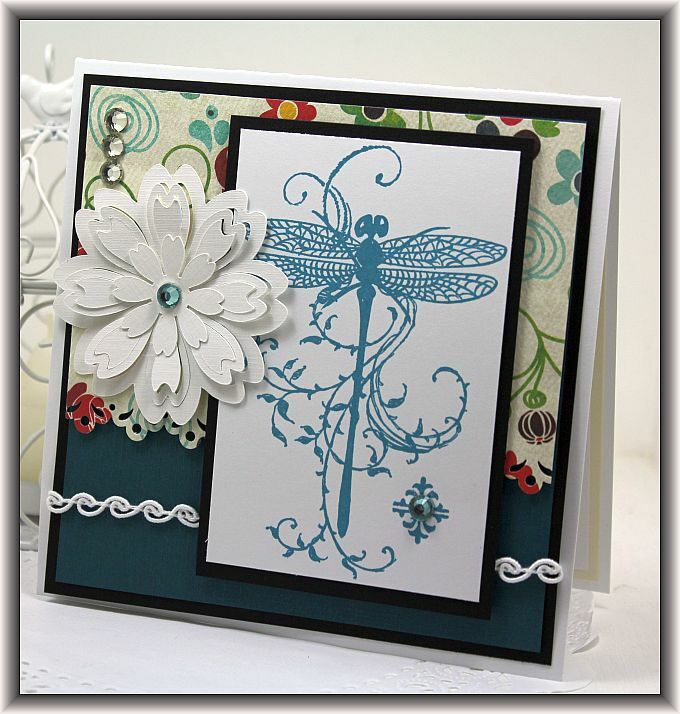 I haven’t shared any cards that I have made lately with my beloved Stampendous Dragonfly Vine stamp! How wrong is that??? This is truly one of my favorite stamps and I always make sure I have several cards in my stash using this stamp. 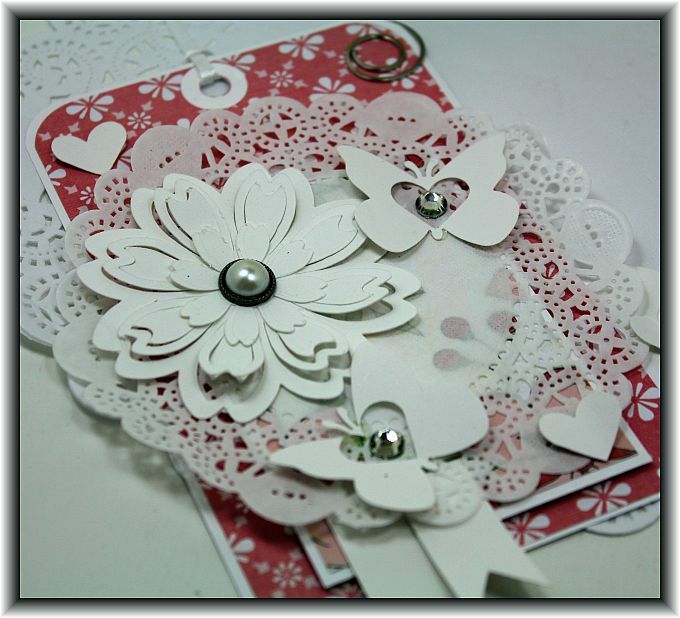 The design paper I used for this card is by My Mind’s Eye, Collectable… I am sure you know by now My Mind’s Eye paper is my number 1 favorite! I hope you are all having a great weekend and thanks for stopping by! I put together this pretty little gift set a couple of weeks ago. I love how feminine it is. The box can hold treats or possibly some jewelery. 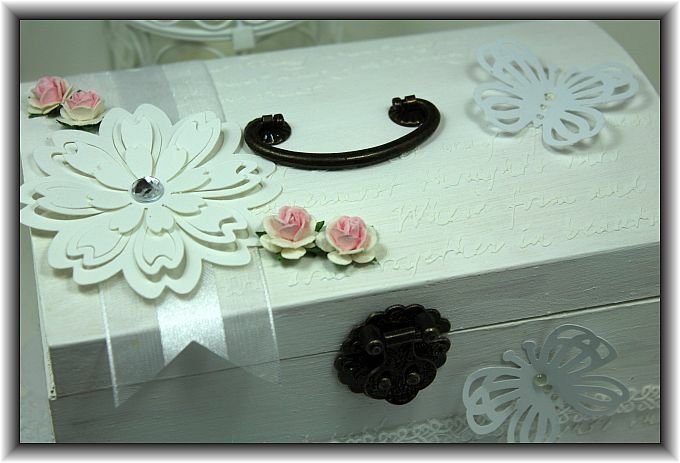 I decorated it with some purchased already made flowers as well as the big white flower that I made using my Cameo. The butterfly punch is by Martha Stewart and I picked up the Punch Around the Page set as well as this single butterfly from The Cutting Garden. 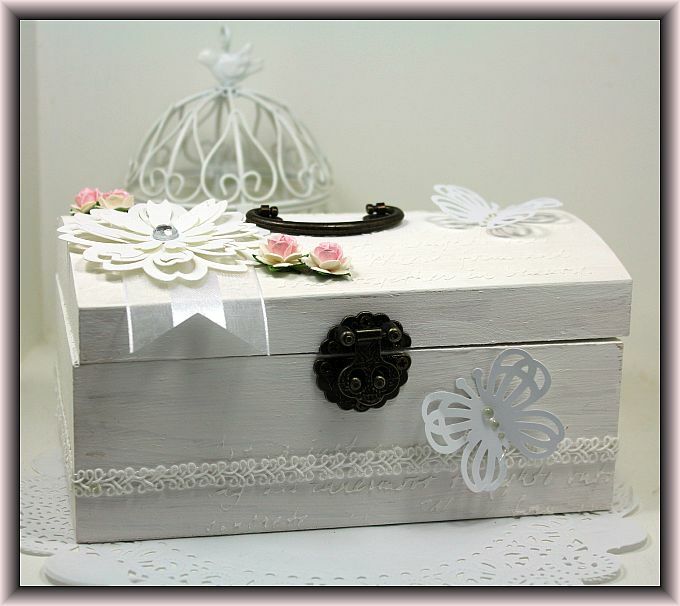 I decorated a white gift bag to match the set for the box to go in. I love hand made gifts, they truly are the best gifts to receive because the recipient knows how much effort you put into gifts like this. I hope what I have shared with you today inspires you to create something beautiful. No one here in Nova Scotia is thinking about gardening right now. We are getting ready for another blizzard starting tonight and it is going to be very cold! Anyway… I have a pretty card to share with you this morning….. I picked up this sweet stamp at The Cutting Garden’s yard sale and I am sure I only paid about $2.00 for it! I am off to work again today and I have a feeling it’s going to be a long one. I stayed up too late last night tidying my craft room as it looked like a bomb went off in it! It is all tidy again now and waiting for me to come home from work tonight to begin messing it up again! LOL! Have a fantastic day and stay warm! Good Morning! I have another quick little post for you this morning. I don’t have as much time as I used to in the mornings because I leave for work earlier now. 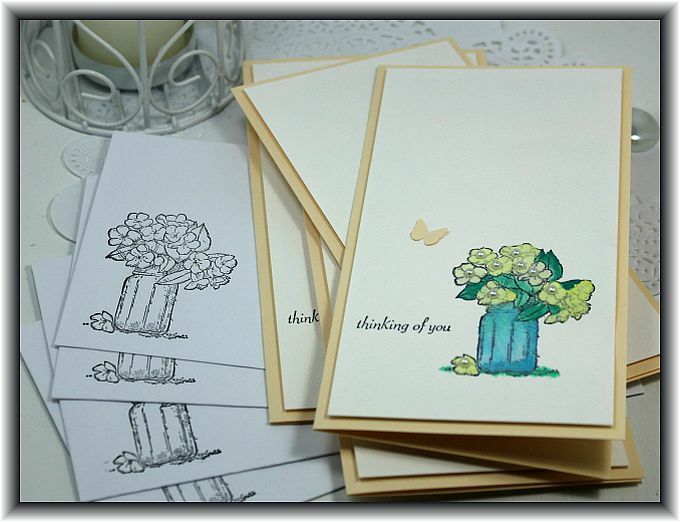 Last night I had a nice relaxing evening in my craft room and I managed to make a cute little set of Thinking of you cards using my On The Grow stamp set and my water color paints. These little cards measure 3 1/4 x 6″. 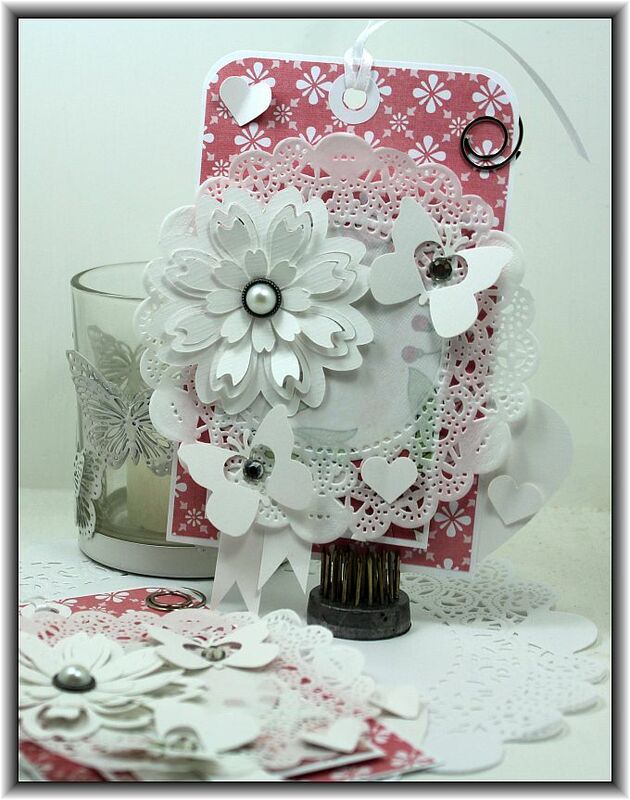 They are very clean and simple cards and are really quick to make. I’m off to hit the shower! Have a great day! I hope you all have had a fantastic Christmas! I haven’t posted in what seems like ages! I am on vacation and have finally found some time to hide out in my craft room! 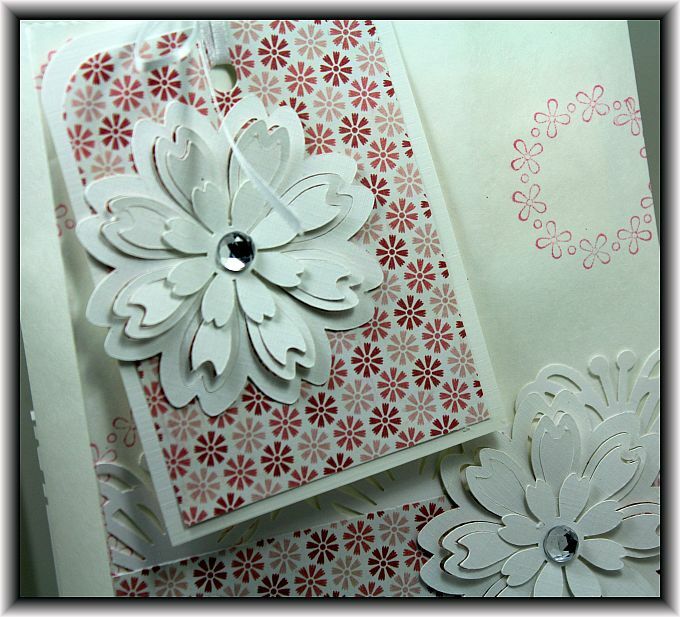 I have been so missing my flower and butterflies so I decided to make some pretty gift tags…. These tags measure about 5 1/2 by 4 1/2″. I used my Cameo to cut out the pretty flowers and my lovely daughter Vicki bought the new butterfly punch from The Cutting Garden for me for Christmas. I just used a little heart punch and punched out the center of the butterflies. These tags turned out so pretty! I am off to run some errands and hopefully visit all the croppers at the all day crop at the Garden.